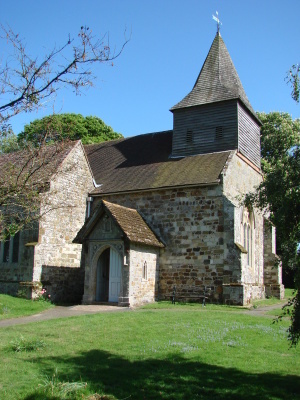 The nave and chancel are basically C13, but the west end was altered and the north aisle added in the C14. The south aisle is C15, though later reduced in size. 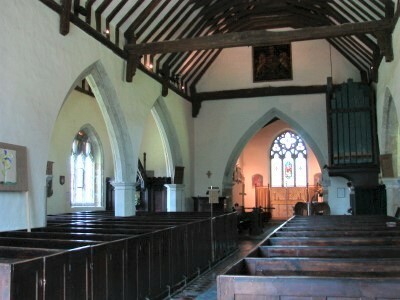 The ironstone nave and chancel are C13, though this is not obvious. The Burrell Collection drawing shows the chancel, which is long in proportion to the nave, with a south east lancet that is now gone and there may have been others hidden by then behind later monuments (1 p82), whilst there is a blocked, pointed south doorway of the period inside. The north side has no feature. C14 alterations started at the west end with a belfry, now boarded with a shingled broach spirelet. Two posts inside look original, though a wooden arch across the nave is C19. To the north, the structure is supported on a low stone shelf. Of the same period is a segmental, moulded south west doorway, now in a later porch. In the late C14 a tall, gabled north aisle was added to the nave, east of the doorway, though only the eastern of the two north windows is of this date. The tracery shows the evolution of style then taking place, with three ogee-headed lights and mullions continued to the top. From them emerge branches that cross in the centre. The two-bay arcade has an octagonal pier and similar responds. The double chamfers of the steeply pointed heads are separated by little more than a groove, a further sign of the date. Godfrey suggests the shallow capitals were altered after the Reformation (2 p1) and the projecting abaci are indeed unusual. However, the chancel arch is similar and both are more probably late C14. 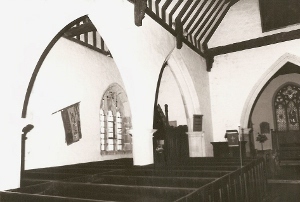 The roof of the aisle keeps its original tiebeams and wallplates. The west wall may originally have been blank, suggesting there was already an adjacent porch. About the same time, a south chapel was added to the chancel. Only the entrance-arch remains, with a head of two hollow-chamfers dying into the responds. It is complete inside, but outside only one jamb can be seen. The adjoining south aisle may be later C15, though the evidence is confused. Like the north aisle, it covered only the eastern nave and the superficially similar arcade, also of two bays, is of rougher workmanship and not aligned with the other. 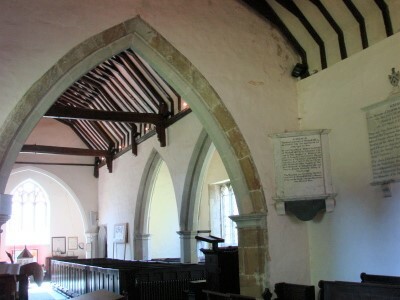 A complete pier by its east respond cannot have belonged to the arch in the chancel and was probably part of an arch between aisle and chapel. The south aisle is not in its original state, for the walls have been lowered, causing the two-light south windows to lose their heads. 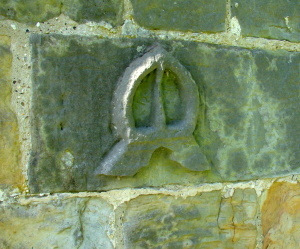 Two of the big ashlar blocks of which it is built, carved with the Pelham buckle and the wheel of St Catherine respectively, seem set at random. 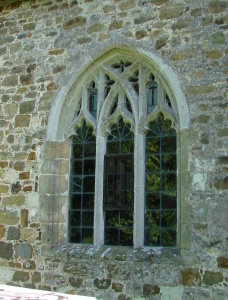 In the blocked arch in the chancel is a two-light square-headed window of C15 type and the east window of the aisle is a single cinquefoiled light of the same date. These may be from the chapel and, if so, suggest it was altered in the C15. The north doorway may also be from there. It has been reset, for its square hoodmould and trefoiled spandrels face inwards. Godfrey suggests (ibid p2) it could be from elsewhere, but in a church with so much reset work that seems a needless complication. If the chapel was indeed altered in the C15, it is possible that changes to the the south aisle followed in the late C15 or early C16, if the remaining detail can be trusted. Whether it was simply reduced in height or more thoroughly rebuilt is uncertain, but that could be the date of the present arcade, though using older material. 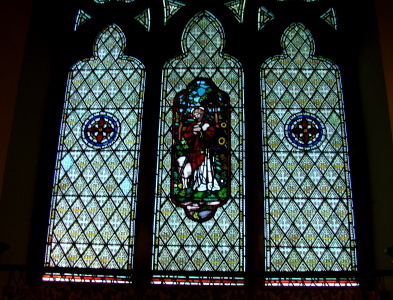 The square-headed western window of the north aisle has cinquefoiled lights and is also C16, but possibly slightly earlier. More remains than usual of the alterations carried out between the C16 and the earlier C19, though the only certain date is the brick south porch of 1737, now a vestry. The window west of this has three timber-framed lights and the Sharpe Collection drawing (1797) shows the west one with three equal lights in a larger pointed opening. 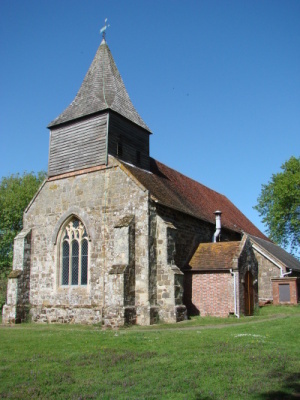 There is irregular buttressing throughout, including some in the chancel of brick. These are likely to be contemporary with the rebuilt east wall, also brick, which looks early C19. In 1855 A Dawes, a local builder, surveyor and churchwarden, signed plans submitted to the ICBS. His intended gallery was not built, but his work is nevertheless reminiscent of the early C19, with varied materials including brick, and the retention of much post-mediaeval work. The roofs (except the north aisle) and belfry were more thoroughly treated, though the plaster was not removed from the south aisle. 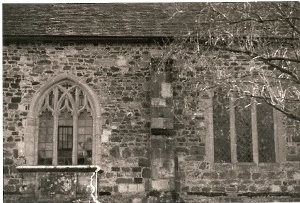 The east and west windows were replaced with Decorated and panelled tracery respectively and a small north porch was added, which is of brick construction but faced with stone. There was a loan of £200 in the same year from the Public Works Loans Commissioners for repewing and repairs (Parliamentary Papers XLVII p189 – my thanks to Martin Jones for this reference) which must be connected, though it probably does not represent the full cost. Font: C19 carved and octagonal bowl. 1. (East window) J Powell and Sons, designed by H Holiday (medallion of Christ in centre light, the rest mostly grisaille glass), 1868 (Hadley). 2. 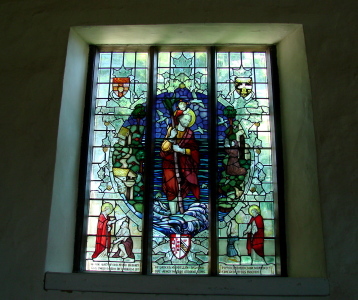 (South nave window) J Hardman and Co, 1938, designed by D B Taunton (DSGW 1939). 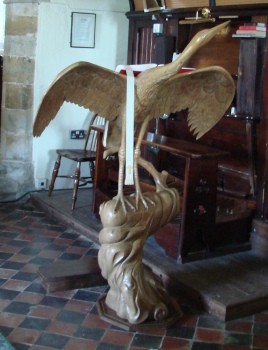 Lectern: In the form of a heron, of elm, carved by M W Pierce, 1979. 1. (Formerly; this was brought into the church from outside but was stolen some years ago) Tombstone by J Harmer, with an illegible date. 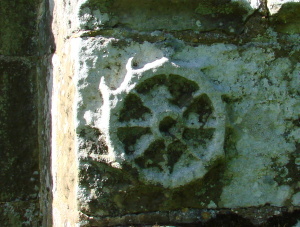 The centre plaque of flowers, usually terra cotta, is cast in iron, probably at Ashburnham forge (SAC 100 (1962) p144). Other terra cotta examples remain in the churchyard. a. Caroline Curteis (d1825) by J Bacon junior (ie S Manning) (Roscoe p53). A child leaning on an urn bearing a profile of the departed. b. Herbert Curteis (d1847) and family by T and E Gaffin (ibid p488). Draped urn bearing a profile above the inscription. c. Reginald (d1847) Urn and willow branch by — Macswiney (signed). a. Mary Inglis (1827?) by J Theakston (ibid p1234). Plain inscription with pediment bearing flowers. b. Charlotte Curteis (1838?) by T Denman (ibid p362). Lilies flanking the inscription. 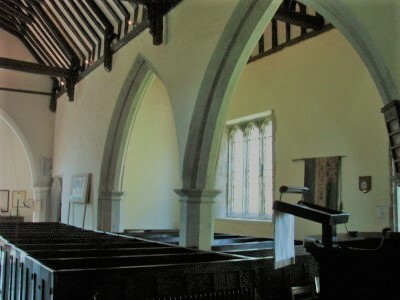 Pews: Almost certainly of 1855 in view of the £200 loan mentioned above which covered repewing, though Nicholas Antram (BE(E) p656) suggests they are C18. However,quite apart from the evidence of the loan, they are relatively low, though with doors, and given the other instances of Dawes’s conservatism, the later date would be much more likely. Pulpit: Plain panels with minimal gothic detail and probably early C19. Royal Arms: (Over chancel arch) George II, painted and dated 1731. Shield: (Jamb of south aisle east window) Reset C14 with the arms of Brassingbourne (2 ibid).